Manager Russell Slade insists he is the man to take Cardiff City forward next season after a disappointing 2014-15. Slade took over from Ole Gunnar Solskjaer in October and expected the Bluebirds to be higher than their current 13th place. Asked to rate his own and the team's performance out of 10, he said: "It'll be a five, might even nick a six if we win Saturday." Cardiff's final match of the season is at Nottingham Forest on 2 May. Despite some fan discontent, Slade is adamant he is the man to take Cardiff into next season. "I believe in myself," he added. "And I think there is a growing unity in the changing room. "It's a strong squad together, a nucleus of a strong squad which needs to be strengthened. We are trying to do that as a group despite the criticism. "It happens, this is football. It's not always going to be rosy. You have flack from time to time at every football club." Though a top six place was the aim when he arrived, he said there were a lot of issues to address and he felt it was too early for fans to judge him. "They should decide over a period, I don't think it is the right time. "Once we have a pre-season under our belts, had a summer and we have regrouped, then may be that is the time to have a look whether significant progress has been made." 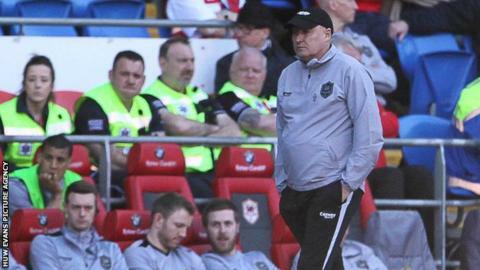 Slade is convinced he will have the backing of owner Vincent Tan to mount a promotion campaign next season with "dialogue" currently taking place over potential summer targets. And he said a good start to next season will be "imperative." Defender Ben Turner could start against Forest, having been sidelined since January with an ankle injury.